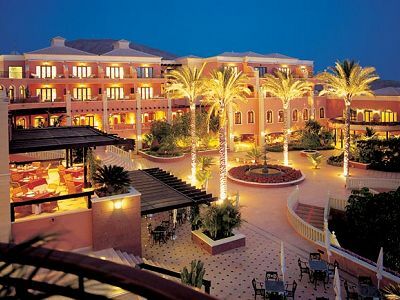 Hotel Las Madrigueras is a 5-star luxury hotel located in Playa de las Americas, Tenerife, overlooking Las Americas golf course. Golf packages include unlimited golf at Las Americas, buggies as standard and preferred tee-times for hotel guests. The swimming pool area at Las Madrigueras features a bar and plenty of space for sunbathing and relaxing in the comfortable sun loungers. Enjoy a light lunch in the “Belle Vue” Terrace restaurant, or try a delicious cocktail in the piano bar or in the pool/snooker room. The “Bogey” Restaurant is also worth a visit, open for copious buffet breakfast in the morning, or an unforgettable “a la carte” dinner in the evening, to satisfy the most demanding palates. Las Madrigueras also offers guests magnificent Spa facilities with a small gym, Turkish bath, sauna and shower temple. Guests also have use of the internet room and hairdressing salon. Restaurants, shopping, beach, promenade and nightlife are also just a short walk away in Playa de las Americas and in the town of Los Christianos. Access is made easy for your Ascot Golf holiday at Las Madrigueras Tenerife with Tenerife South Airport (TFS) just 20 minutes by car, with transfers available on request. Enjoy Unlimited Golf at Las Americas when staying at Las Madrigueras Golf Resort for 7 nights. Unlimited Golf includes Golf Buggy with collection/return to the hotel garage accessible by lift from the hotel lobby. Booking Terms: One Round of Golf may be pre-booked each day, with additional rounds to be arranged directly at the golf course and subject to availability on the day of play. Listed Package Prices: Listed Golf package prices applies for Unlimited Golf with Eagle Package extras. 44 Superior Double Rooms (approx. 40m² and 8m² of balcony), spacious and elegantly furnished and decorated, offering: wooden floor, bathroom with two hand basins, bath robe, hairdryer, direct telephone line, air conditioning, satellite TV, minibar, free safe, balcony or terrace with magnificent views over the “Golf Las Americas” golf course and La Gomera. 4 Duplex Suites, one bedroom, two bathrooms, separate sitting room, balcony, terrace and view over the 4th and 5th holes. 1 “Hole in One” Suite with separate bedroom and two full bathrooms and extraordinary views over the golf course, overlooking 4th and 5th holes. 2 Royal Suites, “Eagle” & “Albatros” with two double bedrooms, two full bathrooms and beautiful sitting room, overlooking the pool area and view to the 4th hole. 6 Junior – Suites, with one bedroom and a spacious sitting room, one bathroom, balcony and terrace with a nice views over the golf course or pool. Enjoy a light lunch in the “Belle Vue” Terrace restaurant, or try one of our delicious cocktails in the piano bar or in the poolroom. The “Bogey” Restaurant is also worth a visit, open for copious buffet breakfast in the morning, or an unforgettable “a la carte” dinner in the evening, to satisfy the most demanding palates. The hotel provides a 24-hour room-service. Located in Playa de Las Américas,Tenerife, Las Madrigueras is located on the Golf las Américas golf course allowing guaranteed tee times and direct access to the first tee. The town of Los Christianos is just a short stroll away allowing access to additional shops and restaurants. Access is made easy as the hotel is within 15 minutes of Tenerife South Airport. Golf Las Americas is defined by wide and flat lush fairways, with water hazards on 10 holes, and palm trees, flowers and shrubs lining the fairways. Visually this is a very pleasant golf course with streams flowing into waterfalls across its gently sloping terrain. The surrounding mountains protect from the wind and sun is guaranteed all year round! Double Superior Room, Breakfast, Green Fees as listed, Golf Buggy, Early Check-in (10am) & Late Check-out (6pm) (Subject to availability), Free Wi-fi, Spa Access, Local Taxes.